The Pixel C tablet will arrive with a 10.2” display, and will be more or less carry a typical A4 size paper form factor, where it can be accompanied by a keyboard attachment that will boast of fully adjustable display angles. This particular keyboard will attach to the back of the device, where it will automatically juice itself up inductively when closed, to make sure that you will always have enough battery life in the keyboard itself to work as and when required. Of course, in order to “connect” to the Pixel C, it will make use of Bluetooth connectivity. This keyboard itself will feature a 1.4mm deep key travel, making it ideal for long writing sessions. 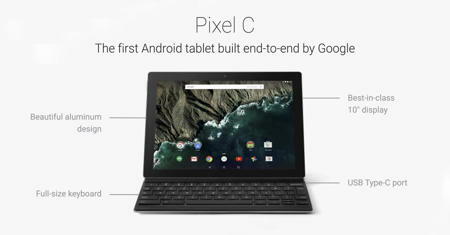 The Pixel C will be a high end tablet, since it comes powered by an Nvidia Tegra X1, Maxwell desktop-class GPU and 3GB of RAM. There will be dual speakers, and a quartet of microphones so that you can speak voice commands from across the room. As for the screen itself, it tickles your fancy with a 2560 x 1800 resolution and 500 nits of brightness. Expect it to arrive in 32GB and 64GB capacities at $499 and $599, respectively, while the keyboard accessory will retail for $149 a pop.